• As of July 2016, 88 percent of Mastercard U.S. consumer credit cards have chips, representing a 105 percent increase in chip card adoption since the October 1, 2015 liability shift. • The company also sees 2 million chip-active merchant locations on its network, a 468 percent increase in chip terminal adoption since October 1, 2015. Two million merchants represent 33 percent of all U.S. merchants. • Of the 2 million chip-active merchant locations, 1.3 million are regional and local merchant locations, representing a 159 percent increase since October 1, 2015. The biggest benefit of chip technology is minimizing the cost of fraud caused, in part, by the use of counterfeit cards. Now, the chips in terminals “talk” with the chips on cards creating unique codes for all purchases. The unique codes protect cards from being counterfeited. Mastercard fraud data shows a 54 percent decrease in counterfeit fraud costs at U.S. retailers who have completed or are close to completing EMV adoption, when comparing April 2016 to April 2015. Demonstrating the power of EMV and the risk of not adopting it, counterfeit fraud costs increased by 77 percent year-over-year among large U.S. merchants who have not yet migrated or have just begun the migration to chip. Mastercard continues to work closely with merchant partners to ease the adoption of chip. Recent initiatives and programs have included: speeding the terminal certification processes from days to hours, while maintaining quality; adding more intelligence on its network to minimize chargeback costs to merchants; and introducing M/Chip Fast, a new application to help speed transactions and shoppers through checkout lines. U.S. consumers have also been central to chip card adoption. While there was an initial learning curve on the chip experience, they now also are seeing the benefit of increased chip safety and security. • Nine-in-ten Americans commonly use chip cards, a 38 percentage point increase year-over-year, from 49 percent in 2015 to 87 percent in 2016. “As more U.S. cardholders use their Mastercard chip cards, they are learning the benefits of increased safety and security. It’s no small undertaking to change the way people pay for things. The only reason to start this big a task is to make people’s lives better. Chips have the potential to do just that,” said Chiro Aikat, senior vice president of product delivery – EMV, Mastercard. Braun Research conducted an online survey in the United States between June 27 and July 15, 2016 among a nationally representative sample of about 1,000 general population consumers, 18 years of age and older. The sample was weighted to be nationally representative of the US population as it relates to age, gender and region, as well as ethnicity/race. At the 95 percent confidence level, the margin of error is about +/- 3.1 percent. Which payment gateways have an EMV certified terminal solution today? Not many. Our lists include gateways with an EMV chip card acceptance solution that can be enabled today, those that are working on it, and those that are not going to integrate. POS software can integrate a payment gateway to segregate payments from applications, and reduce PCI Compliance scope. The payment gateway is responsible for EMV equipment certifications to each acquirer, in addition to P2PE and other features that may be available. CenPOS – standalone or integrated ** . 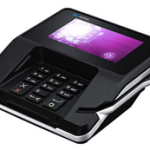 The Verifone MX915 and Ingenico ISC250 are both certified today, with additional pending. Certifications include First Data, Tsys with chip and pin. Click here to see CenPOS EMV chip card transaction. 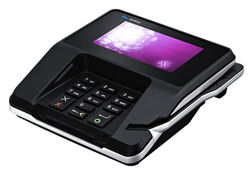 Verifone MX915 multilane signature capture terminal. These First Data Independent Software Vendors (ISV’s) are not planning to do EMV certification *. Since First Data is one of the largest acquirers, it may be reasonable to assume the gateways will not certify to any acquirer. The ISV’s may have a replacement product, thus that’s the reason for not planning to certify. ** CenPOS Sales & Integrations: Contact Christine Speedy 954-942-0483, authorized reseller. Merchants will improve their customer experience accepting chip cards by training all users and cashiers. The transaction process is different for EMV than standard swipe transaction, in order to support the different flow for processing chip cards. In 60 seconds, CenPOS users can view the new screen prompts for the cashier and the consumer to process a chip and signature and a chip and pin transaction. TIP: Having an EMV capable terminal does not mean a merchant is ready to accept chip cards. In the CenPOS environment, if a merchant installed a future proof, EMV capable terminal to get ready for EMV, the next step is to convert to EMV enabled. This always requires turning on EMV at the merchant account level, in addition to other steps. CenPOS has completed certifications for multiple terminals and acquirers to enable merchants to become EMV Compliant today. Contact your relationship manager for assistance. If you’re not a current CenPOS customer, contact Christine Speedy for sales and integrations at 954-942-0483. Don’t just get ready, get EMV Compliant. 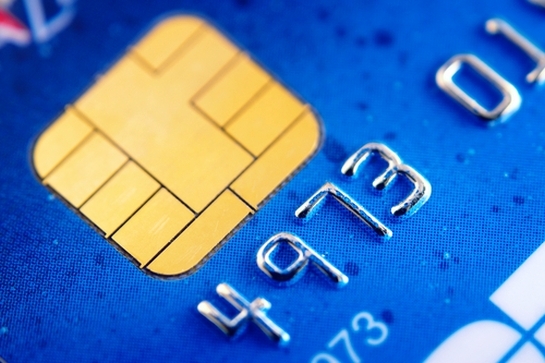 Which acquirers are ready to accept chip card transactions on EMV certified terminals today? Unofficial list of acquirers for retail merchants who want to be EMV Compliant by October 1. As merchants and industry sales people are discovering, not all processors are ready. For those merchants that want to be EMV Compliant to accept chips cards for the liability shift, this is a huge problem. This list is to help avoid confusion about getting you ready vs getting you EMV enabled. Every acquirer, terminal manufacturer, and industry reseller has language in their marketing materials about ‘getting you ready’. And that’s exactly what will happen. Merchants who install EMV capable terminals or Point of Sale systems will be ‘ready’ for when everyone (equipment manufacturer, acquirer, POS or gateway, as applicable) completes their certification. EMV Compliant: Merchant has certified EMV terminals and their merchant account has been EMV enabled to accept chip cards. 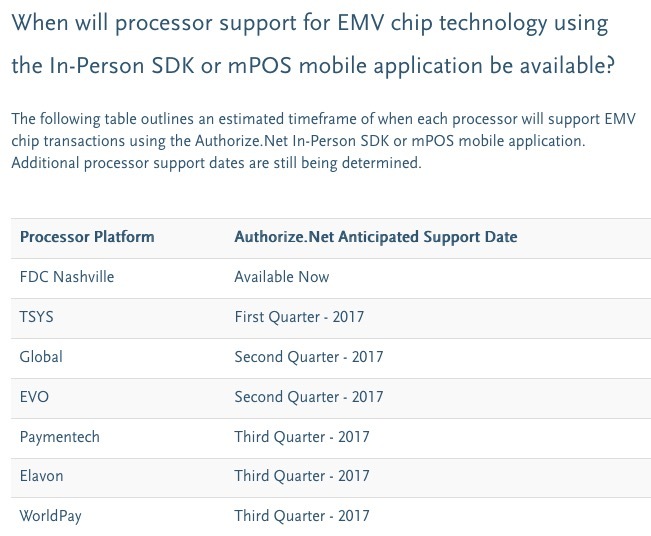 In no particular order, this is a list of acquirers supporting terminal options for merchants to get EMV enabled. There’s one big provision. Acquirers have multiple transaction processing platforms. A merchant could be on a platform that’s not EMV capable yet, though the acquirer has another EMV capable platform. Additionally, the certified terminal solution may require a third party gateway. If changing processors, confirm with the acquirer, Independent Service Organization (ISO), or bank that they can accept chip cards immediately. To make the list, the terminal must support contact EMV debit and credit at a minimum. First Data- FD50, FD100, FD200 series with FD35 required; FD130, FD130 DUO with FD35 required. Note, all terminals require specific application revision. Highline retail cloud software certified VeriFone E315/E335 PINPAD to First Data. Requires using Highline all-in-one- POS software and merchant services. TSYS offers transaction processing products and solutions to financial institutions, including banks and acquirers, among other services. For example, a bank may use both TSYS and First Data in their merchant services environment. TSYS is available as a connection option to most if not all the big acquirers. Bottom line: if your acquirer does not have the EMV certified terminal desired, TSYS may be the solution to more choices. Ask the EMV solution provider, not the acquirer questions, because the acquirer is less likely to know anything about products and services they don’t sell. 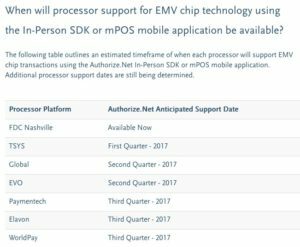 Acquirer, Payment Gateway and POS Solutions Provider EMV Roadmap- Links to the related EMV certification list and or schedule for EMV certification. Bookmark this page now! authorize.net – scroll down the page ETA support dates are 2016; no equipment specifics listed. Note: NFC payments also not supported yet. Shift4 emv roadmap – the 3rd graphic is completed certifications; none in US to date. Sales contacts: 3D Merchant Services offers EMV compliant solutions, including CenPOS, for retail merchants with $1M minimum annual processing; new merchant account may not be required. Data Source: Web sites, acquirer bulletins to industry, Linkedin – I maintain this subject for open comment on the Linkedin US EMW discussion board with over 3,500 members, mostly industry insiders. Recommended reading- EMV handbook for merchants by Verifone. It has a great Q&A section. Have an addition or update? Please add your comments! PURCHASE, N.Y. – May 5, 2015 – MasterCard today announced a new campaign to help the approximately nine million U.S. small businesses already engaged in electronic payments prepare for EMV or chip card technology. Called Chip 360o, the program aims to communicate actionable information, educate on steps to take and advocate why the change is needed to protect cardholders. EMV is a global standard for authenticating credit and debit card transactions to help minimize counterfeit fraud. Microchips or chips embedded in the card face ‘talk’ with chips in payment terminals or ATMs creating unique codes for each transaction. The unique codes make the cards almost impossible to copy or counterfeit. The United States is the only country in which counterfeit-card fraud is consistently growing — accounting for 47 percent of the world’s counterfeit fraud — costing banks $3.4 billion and merchants an additional $1.9 billion per year, according to The Nilson Report (2012). The Payment Security Taskforce estimates that 63 percent of credit and debit cards will contain EMV chips by the end of this year, expanding to 98 percent by the end of 2017.The estimate indicates that banks and retail outlets are delivering on their promise to secure consumer payments with chips. The industry wants to ensure that small- and mid-sized businesses – employing less than 500 people – have the tools to keep pace. EMV Central – MasterCard launched a webpage for small businesses dedicated to all things EMV. Business owners can review articles by industry experts and view fun and informative videos and infographics. The site can be reached via www.mastercardbiz.com. Small Business EMV Webinar and Makeovers – MasterCard and National Federation of Independent Business (NFIB) will host a webinar, “EMV for SMBs,” on Thursday, May 7 at 12 p.m. ET: Click here to register for the webinar on NFIB.com. Small businesses are invited to listen to the webinar live or the audio cast afterward to learn more about payment safety and security. Small businesses can also enter our EMV Makeover contest*. MasterCard experts will collaborate with local service providers to trade out terminals, update software and train employees on accepting the next generation of payments. Expanded Master Your Card Curriculum – Master Your Card, a community empowerment financial education program sponsored by MasterCard, enables financial inclusion and literacy by bringing education on the benefits of electronic payment technology to consumers, small businesses and governments. Course curriculum, including webinars, workshops, brochures and a website, has been expanded to include beginner and advanced EMV modules. Visit the site at https://www.masteryourcardusa.org or by clicking here. MasterCard has been leading the adoption of chip payments around the globe for over two decades. We remain committed to actively supporting our customers and cardholders as the U.S. adopts chip and other next generation payment technologies. MasterCard (NYSE: MA), www.mastercard.com,is a technology company in the global payments industry. We operate the world’s fastest payments processing network, connecting consumers, financial institutions, merchants, governments and businesses in more than 210 countries and territories. MasterCard’s products and solutions make everyday commerce activities – such as shopping, traveling, running a business and managing finances – easier, more secure and more efficient for everyone. Follow us on Twitter @MasterCardNews, join the discussion on the Beyond the Transaction Blog and subscribe for the latest news on the Engagement Bureau. *NO PURCHASE NECESSARY. Open to small business owners and partners who are US residents, 18+. Void where prohibited. Starts 5/7/15. Ends 5/14/15. Restrictions apply. For Official Rules and complete details, visit mcnfibsmallbiz.com.